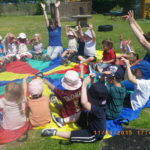 Here at Happy kids we follow the EYFS (Early Years Foundation Stage framework) and promote partnership working with parents and other professionals, to ensure children reach their full potential. 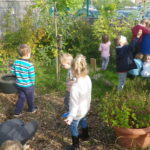 The EYFS framework is for children from birth to 5, with the prime areas Physical development, Communication and Language development and Personal, Social and Emotional development being the key focus within the setting. By focusing on these prime areas of learnin, children gain the skills required to learn and develop further in Literacy, Mathematics, Understanding of the World and Expressive Arts and Design. Positive relationships are promoted and children not only have a positive relationship with their own Key-worker, but also other practitioners within the setting to promote strong, independent characteristics. The environment is an enabling one, that is carefully planned to support the individual needs of the children. This is achieved through observing and planning around the interest of the children by their Key-workers. 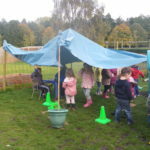 The setting is also organised so children have the freedom to select their own activities, using either the indoor or outdoor environment. Children learn in different ways and at different rates, this is observed within the preschool and children have individual planning, tailored to their current stages of learning and development and their interests.